A Draganflyer X6, six-rotor remote controlled helicopter, which can fly up to 20 mph and travel a quarter mile, is pictured at the Grand Valley Model Airfield in Mesa County, Colo. The Draganflyer X6 is a property of Mesa County Sheriff's Department. NEW YORK -- They hover over Hollywood film sets and professional sports events. They track wildfires in Colorado, survey Kansas farm crops and vineyards in California. They inspect miles of industrial pipeline and monitor wildlife, river temperatures and volcanic activity. They also locate marijuana fields, reconstruct crime scenes and spot illegal immigrants breaching U.S. borders. Tens of thousands of domestic drones are zipping through U.S. skies, often flouting tight federal restrictions on drone use that require even the police and the military to get special permits. Armed with streaming video, swivel cameras and infrared sensors, a new breed of high-tech domestic drones is beginning to change the way Americans see the world -- and one another. Powered by the latest microtechnology and driven by billions in defense industry and commercial research dollars, domestic drones are poised for widespread expansion into U.S. airspace once regulation catches up with reality. That is scheduled to begin in late 2015, when the U.S. government starts issuing commercial drone permits. Veteran aerial photographer Mark Bateson, a consultant to the film and television industry and some police departments, said one reality show producer asked him last year whether his custom-made drone could hover over a desert and use its thermal imaging sensors to spot ghosts for a ghost-hunter reality series. Bateson rejected that request. "But I heard they eventually found someone to do it," he said. "Commercially, the culture already exists," said Ben Miller, a Mesa County, Colorado, sheriff's deputy who has been flying drones with special authorization from the Federal Aviation Administration since 2009. "Turn on your TV and pay close attention to major sports events. You'll see that in many cases they are getting aerial shots using a UAS (unmanned aerial system). I would venture to say that if you've seen an action movie in the last five years, chances are that a UAS was used." Federal legislation enacted last year requires the FAA to prepare a plan to open U.S. skies in 2015 to widespread use of unmanned aircraft by public agencies and private industry. Potential markets include agriculture, shipping, oil exploration, commercial fishing, major league sports, film and television production, environmental monitoring, meteorological studies, law enforcement and the news media. Ten years of war have given robot developers a chance to refine and improve their bots. Now the robots are finding all sorts of new jobs on the homefront. The aviation and aerospace industry research firm Teal Group estimated last year that global spending on unmanned aircraft will double over the next 10 years, to nearly $90 billion, with the U.S. accounting for 62 percent of research and development spending and 55 percent of procurement spending. For decades, model airplane hobbyists have been allowed to fly small, remote-controlled aircraft up to 400 feet and at least a quarter mile from any airport. While public agencies can get permission to use unarmed drones, all commercial use remains banned. "As a hobbyist - I can do whatever I want right now, within remote-control guidelines," said Bateson, the aerial photographer. "But as soon as you turn it into a business ... the FAA says you are violating the national airspace." Bateson said that whether his drone shoots video for fun or for profit, "There is no greater danger to the national airspace." Last year the National Football League petitioned the FAA to speed the licensing of commercial drones, joining Hollywood's Motion Picture Association of America, which has been lobbying the agency for several years, an MPAA spokesman told the drone news website UAS Vision. The FAA has issued 1,428 drone permits to universities, law enforcement and other public agencies since 2007, when the agency formally banned commercial drone use. Of those, 327 permits remain active, said FAA spokesman Les Dorr. Bateson flies a customized 48-inch-wide Styrofoam fixed-wing remote-controlled aircraft that cost about $20,000 - compared with up to $1 million for a helicopter. He said his aircraft has logged 1,800 miles and has recorded 60 hours of high-resolution video. He said he has never run into trouble with the FAA. Patrick Egan, an unmanned aircraft consultant to the U.S. military and editor of sUAS News, a drone news website, said the FAA's commercial ban on drones is unenforceable. "How do you possibly enforce these regulations?" he said. Earlier this year, Connecticut marketing firm ImageMark Strategy and Design launched a drone-powered aerial photo and video service to offer to its existing clients, which include universities, golf resorts and real estate firms. Partner Scott Benton said his company invested about $20,000 in remote-controlled multi-rotor copters equipped to carry camcorders or SLR digital cameras with swivel tilts. Benton said he wasn't even aware of FAA restrictions on commercial drone use until after he purchased all the equipment. He said his company plans to charge clients for editing and post-production work, not the drone flights. Many commercial drone operators offer similar arguments. Some say they operate only on private land. Others say they are selling data, not drone flight time. Still others say they will simply take their chances. "Honestly?" said one commercial operator, who requested anonymity to protect his business. "My hope is that I'm far afield enough and small enough potatoes to the FAA that I can fly under the radar on this one." In 2011, News Corp's tablet news site, the Daily, sent a Microdrone MD4-1000 into the skies over Alabama, Missouri and North Dakota to capture dramatic aerial footage of flood damage. A subsequent FAA investigation resulted in a warning, an FAA spokesman told Reuters. A News Corp spokesman declined to comment. Last fall, a collective shudder rose up from Hollywood when false reports surfaced that the aggressive tabloid news website TMZ was seeking permission to fly its own drone. The report was false, but it raised concerns. "I'm less worried about the police getting a fleet of drones than I am about the news media," said Egan. "Imagine what it will be like when the paparazzi can send a fleet of drones into the Hollywood hills." The boom in drone use, both private and public, is also raising privacy concerns. Civil liberties groups are urging federal and state legislators to place immediate restrictions on drone use by U.S. law enforcement agencies, which have historically been quick to capitalize on emerging technology like cell phone tracking. At least 15 states have drafted legislation that would restrict drone use. In Seattle last month, a public outcry prompted the mayor to order the police chief to return the department's two new drones to their manufacturer. An even bigger concern for many is security. The activities of some drone operators are fueling fears about the potential for terrorism or that drones could interfere with manned air traffic and cause an accident. A group of skilled drone operators using "first person view," or FPV, technology, has sent Ritewing Zephyr drones that capture high-quality video of visual thrill rides around some of the world's most famous landmarks. The group, known as Team Blacksheep, has made a series of videos using drones circling the torch on New York City's Statue of Liberty and London's Big Ben clock tower. Team Blacksheep's FPV drones have darted through the arches of the Golden Gate Bridge and buzzed the peak of the Matterhorn. The videos, captured at dizzying angles, are wildly popular online, but hobbyists and other drone enthusiasts worry that such videos give the industry a bad name. "Those are the people the FAA should be going after," Bateson said. A Team Blacksheep founder did not respond to requests for comment on security concerns. Would-be attackers have already tried to exploit drones. Last fall, a Massachusetts man was sentenced to 17 years in prison for plotting to attack Washington, D.C., with three remote-controlled airplanes carrying C-4 explosives. 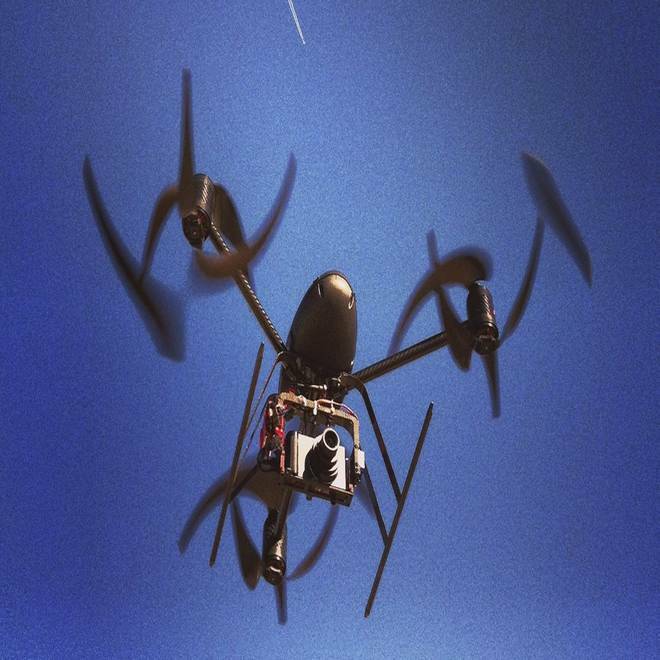 Drones may also be vulnerable to hacking. Last summer, Department of Homeland Security officials challenged Texas aerospace engineering professor Todd Humphreys and his class to try to "spoof" a DHS drone's GPS system. GPS "spoofing" is a technique by which a vehicle's GPS receiver can be tricked and taken over by a slightly more powerful signal that mimics the attributes of the original signal - essentially an airborne hack. Humphreys and his students succeeded in hacking the drone and took control of its flight path. If a college class "can spoof the GPS, what can other nation states or terrorist groups do?" Representative Paul Broun (R-Ga.) asked at a recent congressional hearing on domestic drones. Some U.S. drone designers worry about the consequences of what they see as a slow U.S. response to a rapidly evolving technology. "The Chinese are going to kill us," said Texas pilot Gene Robinson, who spent $20,000 designing an innovative fixed-wing drone for search-and-rescue missions. "They have copied every single design, including mine, that they can get their hands on." Robinson said he installed Web-tracking software on his drone design Web page and then watched last spring as a Chinese design company "spent a month on my Web page ... reverse-engineered my design" and began selling mass-produced copies in December - for $169. Side-by-side pictures of Robinson's model and the Chinese model that he showed a reporter look virtually identical. Robinson went online and ordered one of Chinese models - to see if he could attach his equipment to the cheaper version. "It was a dog, a pig," he said. "It didn't fly worth a damn."